Single flat page, with original outline colour,printed one side only, verso blank. Dated below the image. From the S.D.U.K. Atlas published in 1844. Light crease across top right. May be signs of age and usage around the margins. 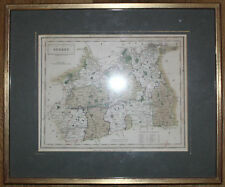 SURREY, 1858, J.& C. Walker - Original Antique County Map. J. & C. Walker, Holborn, London. 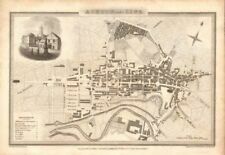 Original Antique Map. - suitable for framing. Minor aging /marking to margins consistent with light usage only, with no material effect on the image after framing. No images and/or text printed on the reverse. Several further editions were published up to 1889. Title / Subject: 'Surrey and Sussex'. A scan of this key will be included with the map. Condition: Excellent condition. Centrefold as published. 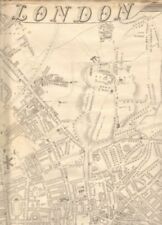 Large detailed map by B R Davies from the Dispatch Atlas, published in 1863. 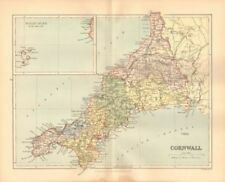 Lithographed map with original outline colour. Printed on light grade paper, one side only, verso is blank. 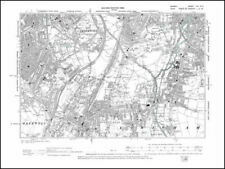 Single page map with good margins, suitable for framing. Single flat page, with original outline colour,printed one side only, verso blank. Dated below the image. From the S.D.U.K. Atlas published in 1844. Crease across top of map. May be signs of age and usage around the margins. Thank you for looking at this item. Date: c1897 Size: 26cmx31cm Condition:good, with some browning We provide quality photographs and these should studied as they form part of the description. Verso: Your item is blank on the reverse Notes: saved from a disbound book. P4. Large detailed map by G W Bacon, published in 1895. 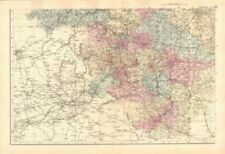 Lithographed map with original colour. Printed one side only, verso is blank. It is a large map with central fold as issued. 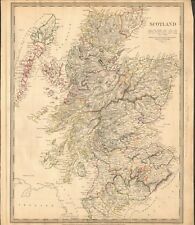 New and Correct English Atlas first appeared in 1787 but by 1809 the plates had been used so worn that new, nearly identical, plates needed to be engraved. These were used upto a final issue in 1843.